Happy New Year from Cairo! This post originally appeared on the Planeterra Community Blog. A lot has happened here since my last update. 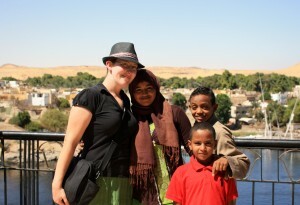 Following my visits to Alexandria and the Sinai Peninsula, I went to Upper Egypt, home of the cities of Aswan and Luxor. 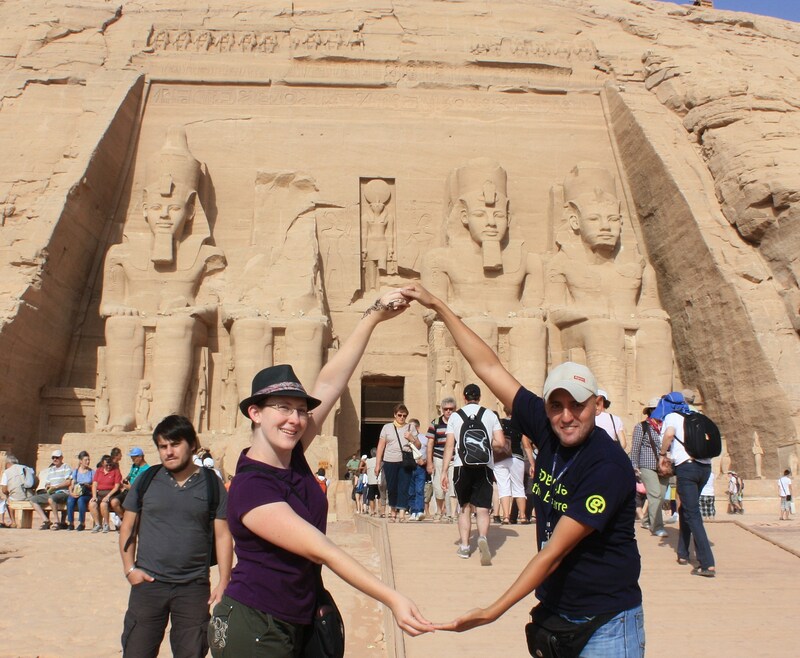 From Aswan, I joined a group to visit the incredible temple of Abu Simbel, one of the most impressive sites in all of Egypt. The temple itself is awe-inspiring in its size and grandiosity, but even more impressive is the fact that it was moved completely when the Aswan High Dam was built—each individual block was painstakingly transported and reconstructed so that the temple would be preserved. Pretty awesome! 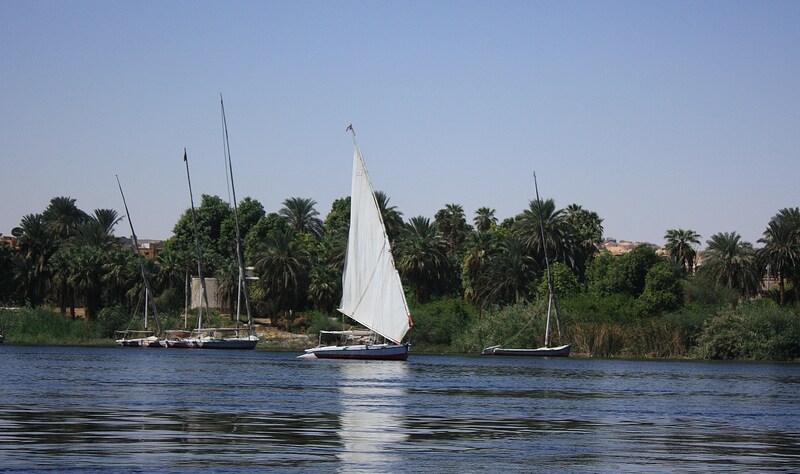 I also had the chance to take a daylong felucca ride down the Nile on the way from Aswan to Luxor. 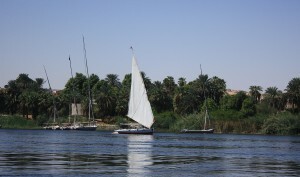 Temples are impressive, but I found the felucca ride even better. In a sailboat, you can watch the palm trees and temples roll by, with scenes of daily life unchanged for hundreds of years. Following Luxor, I went out into the remote Western Desert to visit the 5 oases of Kharga, Dakhla, Farafra, Bahariya , and Siwa. 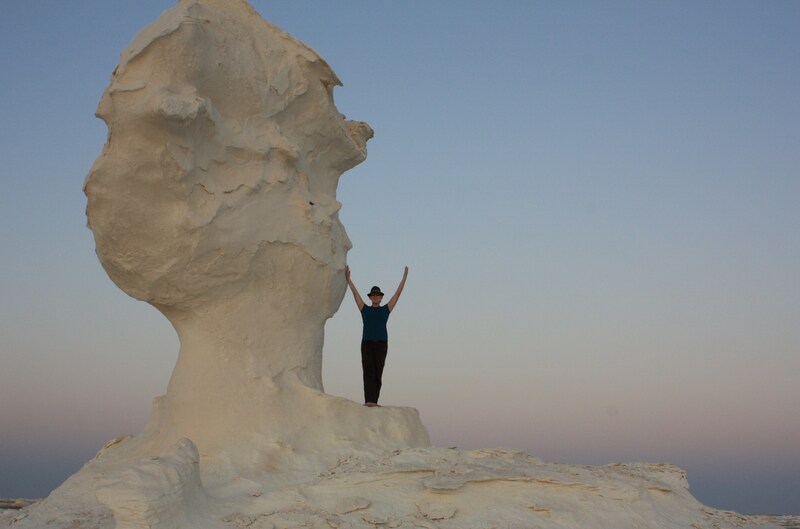 I even got the chance to go camping among the mysterious rock formations in the incredible White Desert. In each of these amazing places, I found a host of potential projects for Planeterra to support. Village associations with their own schools and health centers, women’s cooperatives for sewing and handicrafts, irrigation canals and sanitation projects…every place I went had a different priority, a different effort to improve local livelihoods. The sheer number of projects to look at was daunting, but also an incredible sign of local efforts to improve their own lives and situations. International media might focus on Egypt’s difficulties, but in my work and travels here I’ve been impressed by Egypt’s strength. 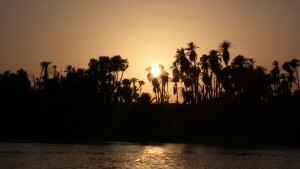 Every village is full of possibilities, and Egypt’s people are full of hope for the future. 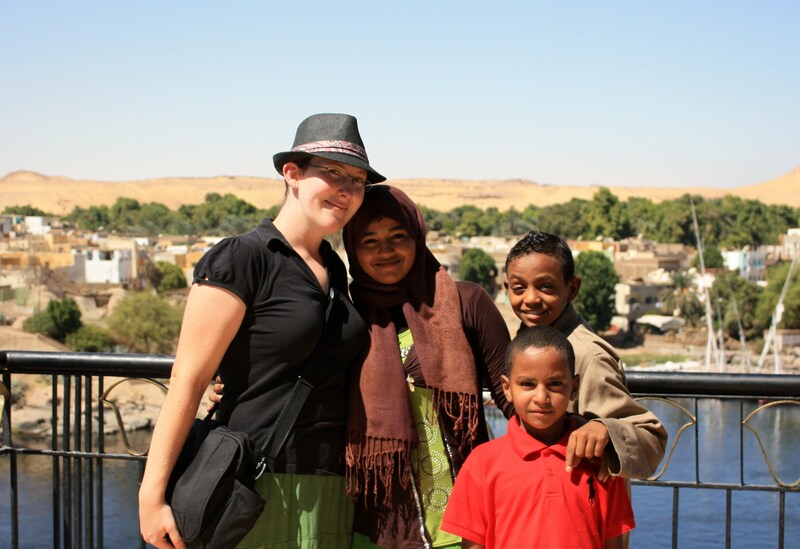 It’s important to point out here that during all of my time and travels in Egypt, I’ve never once felt unsafe. 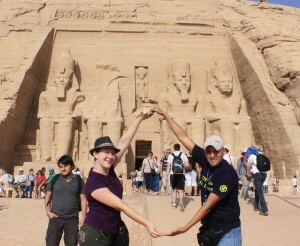 Despite all the unrest in Tahrir, Egypt remains a very safe place for foreigners to visit. I’ve been welcomed with goodwill and hospitality in every town and village, and the other travelers I’ve met here all agree with my conclusion: Egypt is an amazing place to be. This evening, my new flatmates and I were supposed to go out to experience Egyptian Cabaret in all its sleazy glory. I’m living with the incomparable Cairo-based artists Lorna of Cairo and Ellie of London, and there’s nothing better for a flat full of artists than to go out and experience other forms of art, wherever and however they might be found. We took a cab into downtown, near Tahrir, to look for a certain dive that Lorna knew of. When we arrived, however, we experienced a shock. All the shops, normally closed well before midnight, were open. Lights were blazing, the streets were full, and everyone walked around in pre-holiday excitement in preparation for Eid. This meant two things. First, Lorna couldn’t find the cabaret, because every other time she’s been there the shops have been closed. With everything open and all the lights on, the usual landmarks didn’t work. Second, when we finally did find the place, it turned out that the cabaret was closed–because drinking booze and watching girls shimmy is apparently haram (forbidden) before Eid. Like any enterprising women, then, we decided to figure out Plan B. We could go shopping, since the stores were all open, but we wanted to relax. Cup of tea in a local coffeeshop, then…with bellydancers on the TV. Many, many bellydancers. A whole channel full, in fact. And they were better dancers than we’d have been likely to see at the live cabaret, which as mentioned before is fun largely because of the level of sleaze, rather than the talent of the dancers. Lorna and Ellie decided, after several dances, that it was imperative that we find this channel on the TV at home, in the interest of having access to 24-hour a day bellydance. The name of the channel that we needed to search for? And yes. That means exactly what you think. Today I took advantage of the fact that I’m working with a major travel company by tagging along for a group sightseeing day. Today was a classic “visiting Cairo” kind of day. One of my colleagues was taking his group to the Egyptian museum and the Giza pyramids, and so I tagged along, joining the throngs of tourists to look at the wonders of Egypt’s pharaonic past. The Egyptian museum, I discovered, is much better with a guide. I remember seeing it my first time in Egypt, six years ago, and being overwhelmed by the sheer number of artefacts on display, jumbled together in cases without labels. I tried to look at everything, but it was impossible to absorb it all. During his time as pharaoh, Kheops forbade the creation of statues with any likeness other than his own, dashing the hopes of an afterlife to all his citizens for a generation. Consequently, after the pharaoh died, people destroyed all of his statues in retaliation. The only surviving statue of the pharaoh who built the Great Pyramid is only about three inches high. At least his pyramid survived. Though learning details about the other pharaohs was interesting, the highlight of the Egyptian Museum is and always has been the treasure of Tutankhamen. From my trip to Egypt six years ago, Tutankhamen’s death mask is one of the few items that I remember with great clarity. Though iconic, photos do not do it justice. The sight of it alone, in person, was worth the cost of the entire trip. This time around, I noticed more details. The finely worked hieroglyphs on the mask’s interior, the intricately inlaid semi-precious stones around the rim. The details of the boy-king’s facial features. The textures of the gold and gems. The other incredible treasures of the tomb, including fabulous amulets of scarabs and winged goddesses to keep the king safe as he journeyed through the afterlife. After the Egyptian Museum we headed for the Giza plateau, to visit the great pyramids. Massive wonders of the ancient world, looking out over the city of Cairo in unexpected proximity. The sprawling suburbs of Giza are only a few minutes away. The pyramids themselves are surrounded by tourist touts barking camels and overpriced souvenirs. I ignored them, and focused on the monuments themselves. The smallest of the three main Giza pyramids was the one we chose to go inside, and we entered down a long, narrow shaft near the base of the tomb. Though the walls were close and the ceiling low, the space wasn’t nearly as claustrophobic as I expected. At the end of this long tunnel was a central chamber, followed by another tunnel to another chamber, probably the one where the king was buried, thousands of years ago. Standing in that central chamber, I could feel the weight of history, like the weight of the stones pressing in above my head. I was standing inside the one of the only surviving wonders of the ancient world. There’s almost nothing more incredible than that. This evening I took a jewelry making class at Boston Bead Works in Cambridge. The shop, on a side street in Harvard Square, is a great local secret for bead and jewelry aficionados, and contains a wide selection of glass beads, cloisonne, and semi-precious stones. Though I’ve dabbled in jewelry making off and on (mostly off) for many years, I’d never taken a class before, and was pleasantly surprised. 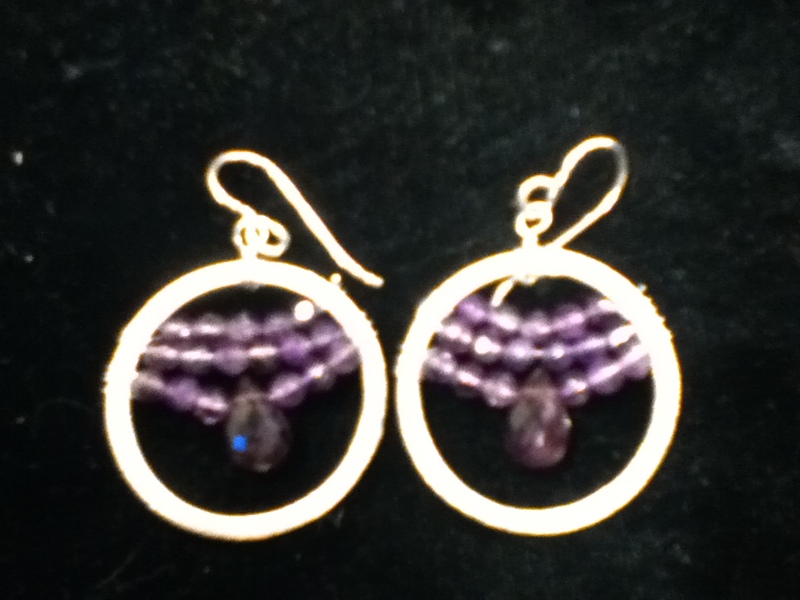 The class was small, the instructor was attentive, and at the end of the evening, I had a shiny set of earrings made with a wire-wrapping technique I’d never before seen, stringing amethyst beads inside a silver hoop to resemble an abacus. The photo quality here isn’t great because I took the picture with my ipod. But you get the idea. Though I could leave the post here, as a “this is a cool thing to do if you’re in Boston,” I prefer to take a moment to think about why activities of this kind are available specifically here. Bead shops like this one exist in cities all over the US, and I’ve seen them in Western Europe as well. In the developing world, though, art supply shops with classes on how to make things are pretty much non-existent. In China, when I was buying seed pearls, the saleslady was aghast that I wanted to leave my strung pearls as-is, rather than having them made up into a necklace or earrings right away (I relented and allowed her to turn a few strands into jewelry there at the shop–the necklace and earrings that she put together are quite lovely). Point being, though, that the idea that I would want to go home, take the strands apart, and make something by myself was pretty much unheard of. There’s a particular mentality in the West, and in the US in particular, that basic art techniques can and should be accessible to everyone, if only on the simplest levels. Shops like this one offering beginning jewelry making, paper embossing, paint-your-own pottery, etc. are exceedingly common. The do-it-yourself mentality is strong, and structured art projects give people a sense of fun and accomplishment. From what I’ve seen in the developing world, things are very different. Crafts like pottery and jewelry making are seen as professions, rather than leisure activities for the middle class. Though I did have a friend in Morocco who made pottery for fun, she was very much in the minority. And the fact that she worked closely with American Peace Corps volunteers may have something to do with her view of art as a potential leisure activity. What makes this difference, between craft as profession and craft as leisure? In some ways, it may come from how consumer goods are produced in a given society. In a society like Morocco, where until very recently most peoples’ plates and cups came directly from the potter’s wheel and had damned well better be usable, making pottery was not something to be tinkered with. Likewise, if you wanted jewelry, it was going to be handmade by a craftsperson, and the supplies needed would generally only be available to the professionals. In a society like the US, where most of our plates, cups, jewelry, and pretty much every material object is manufactured, rather than made, crafts like pottery and jewelry making are seen as quaint activities and throwbacks to an earlier time. If you make your own bowl and it breaks, you might be sad, but you can still buy another bowl at Target. If you make your own earrings and mow through a foot of silver wire trying to bend it into the right shape, it’s okay, you can still buy earrings at the mall. Your efforts aren’t materially affecting your well-being, nor are they taking away from anyone else’s profession. So you’re free to explore, and free to screw up, and you spend an enjoyable afternoon. I’ll be curious to see, as manufactured goods spread to more societies, and as leisure time among the middle classes increases, whether the phenomenon of do-it-yourself craftwork catches on in the developing world.